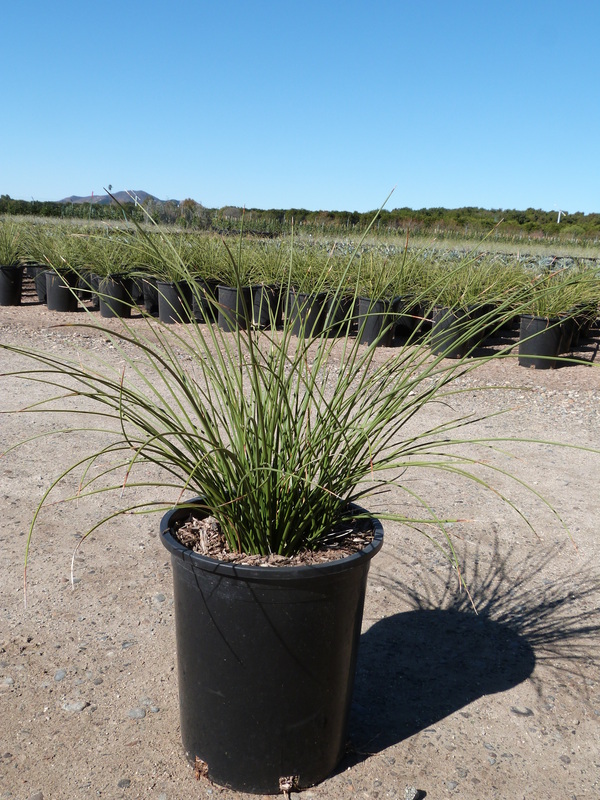 Dasylirion longissimum, commonly referred to as Mexican Grass Tree, is a dense, evergreen shrub perfect for the drought tolerant landscape. Its architectural form grows in a rounded shape that is well suited to either container growing or planting directly in the garden. This Mexico native features very long, grass-like leaves that radiate symmetrically out of a large, woody trunk. Each summer, one large spike of red-budded blooms emerge. The buds eventually give way to creamy white flowers. Remove foliage from the bottom of the plant to expose its attractive trunk. Because of the lack of spikes on their leaves, feel free to plant Mexican grass in high traffic areas. It is also well-suited for spaces that receive very little water. It is also deer resistant and somewhat fire resistant as well. When watered well during the first year, it will grow an extensive root system that will require very little water once established. Plant alongside other drought tolerant species such as Bottlebrush, Agave, Yucca, or Chitalpa.